"Aquatica Plus UK ships The Day I Swapped my Dad for Two Goldfish (Book & CD) from Amazon.co.uk. Amazon.co.uk has fast shipping in the UK and often free shipping on pond and aquarium supplies. Add to your basket now while supplies last to avoid delays." What customers say about The Day I Swapped my Dad for Two Goldfish (Book & CD)? My son was given this book when he was five, and together we have read it with great relish. It is a hilarious story of sibling bickering, playground swapsies, and emotional family bonds. We still enjoy reading it now that he is seven. The story is magical, and the illustrations are out of this world. If you don’t have a kid of your own to buy it for, buy it for someone else’s kid, but make sure you read it before you give it to them. When a young boy (the story doesn’t give him a name) decides to swap for a friend’s goldfish, he finds that his father is the ultimate bargaining chip–after all, hasn’t everyone always wanted to own one? The boy’s father is such a hot item, in fact, that the neighborhood kids pass him back and forth, making one deal after another. Eventually, the mother sends the boy and his little sister to recover their father (“The very idea,” she says), and they follow the swapping trail, redistributing the trade items as they go. 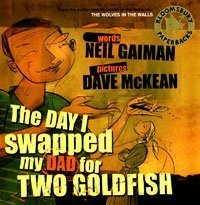 “The Day I Swapped My Dad for Two Goldfish” is a brilliantly illustrated adventure map that navigates the relative values and the strange economy of childhood. Neil Gaiman’s lively text is written with that special children’s logic and fresh humor found in classics like “Winnie-the-Pooh” and “Peter Pan,” and the rich texture of Dave McKean’s images–vivid line drawings and colorful montages–gives the story a look that is unique in children’s literature. This book occupies a special place in my library with a very few picture books, like “Old Turtle” and “Little Hobbin,” that I could never part with. This isn’t just a kids book! I’m in my late twenties and I love it! The illustrations are utterly fabulous! The story is imaginative and funny! Anyone who loves beautiful, original, eclectic kids books will treasure this!! !